- 4" commercial casters; 2 with brake. 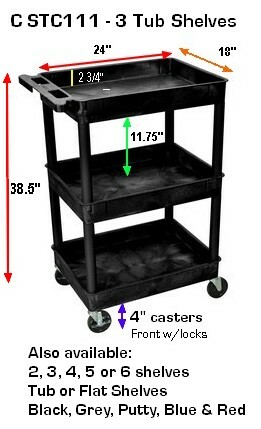 - Shelf height clearance: 11 3/4"
Keep your items organized and transport them safely and efficiently with this heavy-duty industrial plastic utility cart. It includes 3 bin-type tub shelves to effectively hold all items in place. 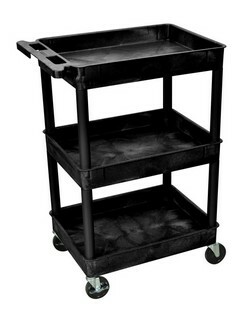 This is a commercial grade utility cart, with strong swivelling wheels. Made of high-density polyethylene structural foam molded plastic shelves and legs that won't stain, scratch, dent or rust. Virtually indestructible, plus Lifetime Warranty! These carts are made of high density polyethylene structural foam molded plastic shelves and legs that won't stain, scratch, dent or rust. The shelves include retaining lips. Optional surge suppressing electrical assembly has 3-outlets 360 degree swivel cord wrap that attaches to the leg of your choice. The above can be made with 2 or 3 shelves and with either tub or flat shelves. With the drop down menu on the left, build your own configuration, by choosing your color, plus the quantity & type of shelves. You can also simply contact us for the exact combination of shelf quantuty (up to 6 shelves! 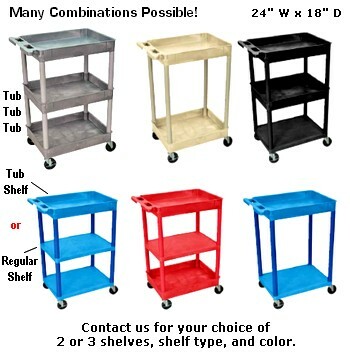 ); shelf type (Tub or Flat) and color (Black, Grey; Putty; Red or Blue).